When we first met with Jen and Charlie last January, their vision was clear: a monochromatic floral palette and statement worthy flowers polished with a soft and rosy glow. Over the past year we became close as we searched for the right florist to bring the look to fruition as well as the perfect blush pintuck linen. Guests gasped with delight as they entered the ballroom, and continued their excitement as they danced the night away. Jen and Charlie definitely got their wish and we were absolutely ecstatic to execute their dream from start to finish. 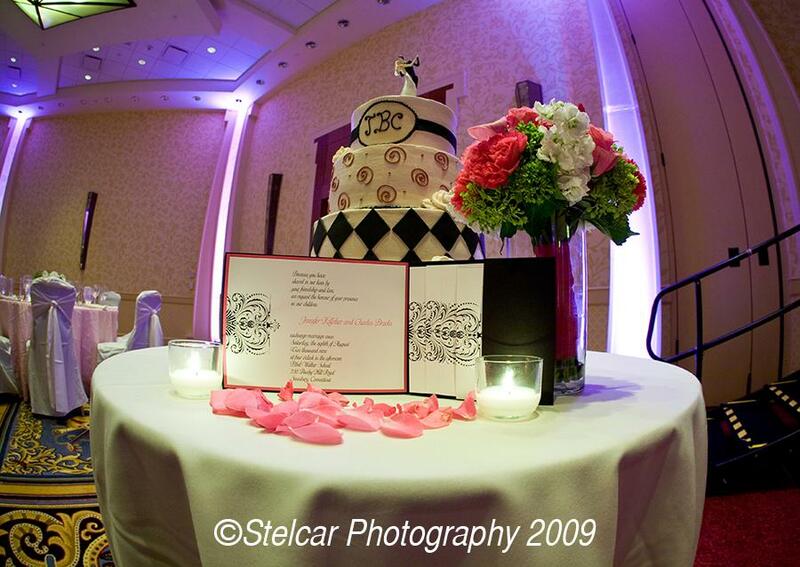 All photos courtesy of Stelcar Photography. I started my day checking in with Jen and her ladies as they were prepped by Liz and Candice of Naomi’s Salon and Spa. They all looked incredibly glamorous, and incredibly calm as they brunched and got all done up. Jen wore a gorgeous Jim Hjelm gown, purchased at Mariella Creations, with a fabulous broach detail on the back, juxtaposed by hot pink shoes! Her ladies in waiting looked equally lovely in clean-lined yet dramatic floor length black Bill Levkoff dresses. 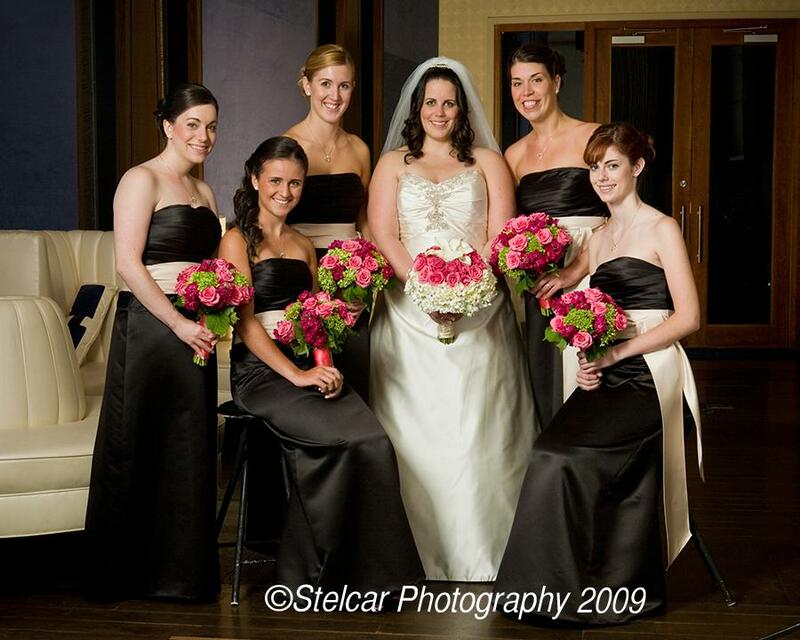 Jen carried a bull’s eye style bouquet of watermelon colored roses, callas, stephanotis and hydrangea while the girls arrangements of hot pink and watermelon colored roses, stock and and green hydragea. 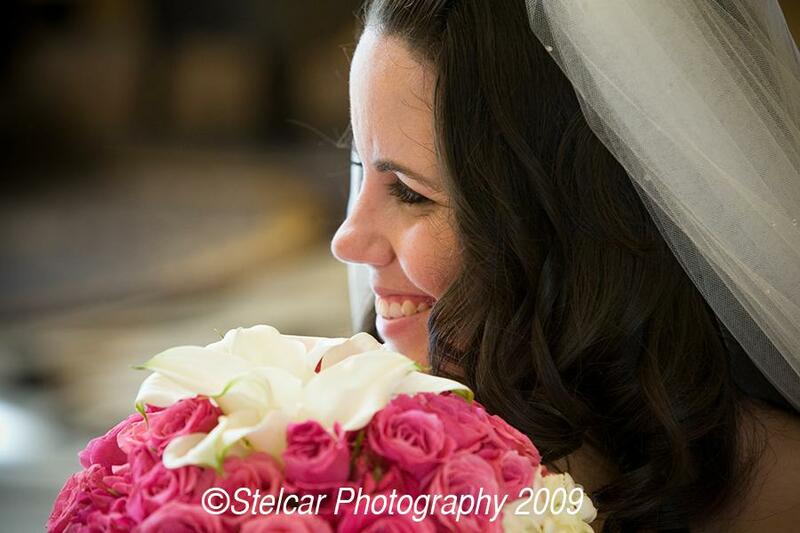 Carey of Stems (who Talia and I were reacquainted with at the Newport LaBella Bride showcase) provided the incredible flowers and was an absolute pleasure to work with. 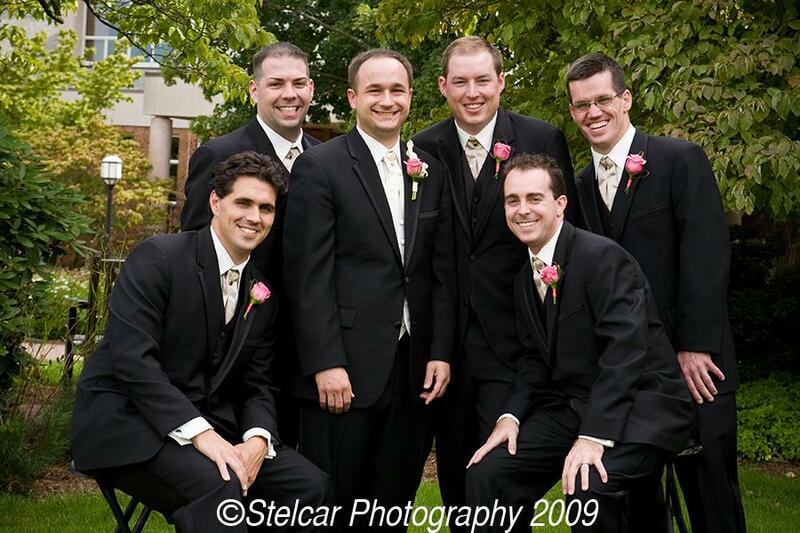 Charlie and his groomsmen took a few minutes for formals before the ceremony. 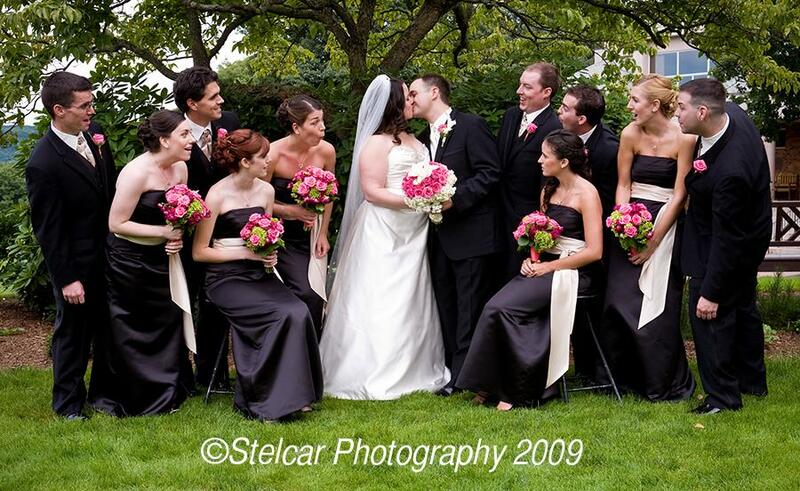 They sported tuxes from Formals by Antonio and were quite the animated crew! 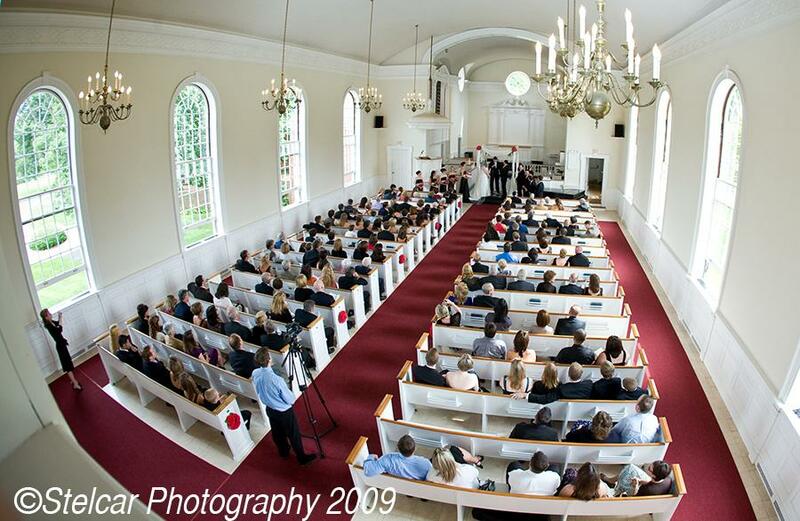 Jen and Charlie were married in the late afternoon on Saturday, August 8th at the Ethel Walker Chapel. 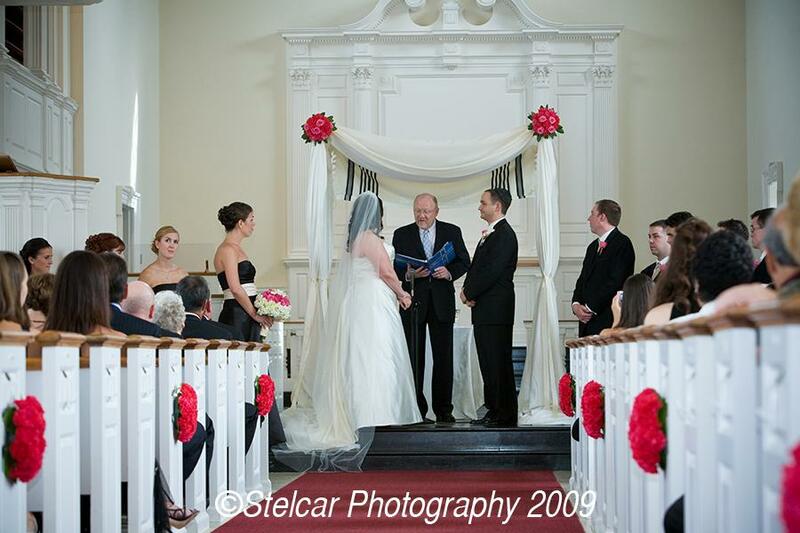 They wanted to bridge both their Protestant and Jewish faiths by being married under a softly draped Chuppah, within which hung a prayer shawl from Charlie’s family. The pews were decorated with really fun hot pink carnation wreaths, adding just the right about of splash of color to the otherwise neutral space. Jen walked down the aisle with both her father and step-father, which was incredibly touching to witness. Millennium Music accompanied the ceremony and as always, the music was beautiful and timing flawless. Cocktail hour followed at the Hartford Marriott Downtown, in the expansive art deco style foyer. 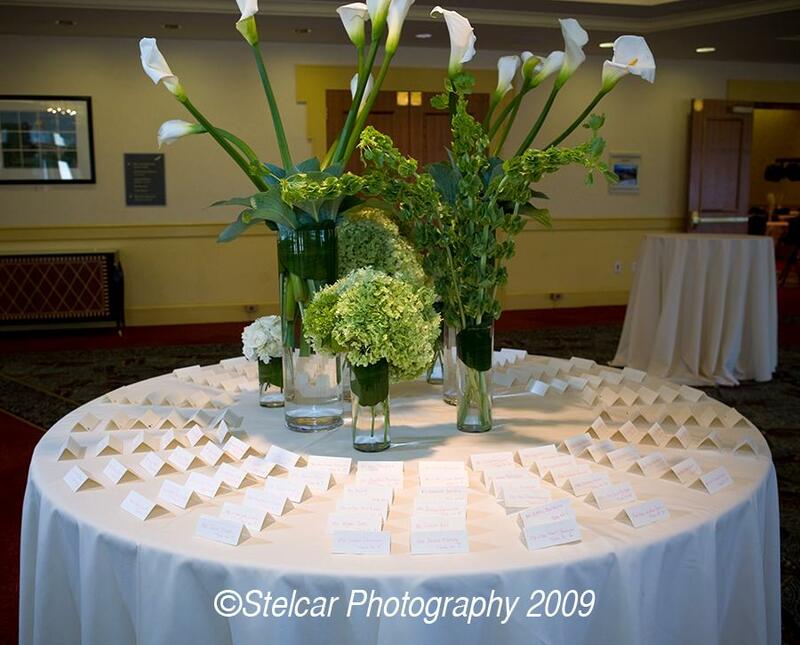 Guests were greeted by a large table with a myriad of different same flower arrangements such as callas, hydrangea, and Bells of Ireland. 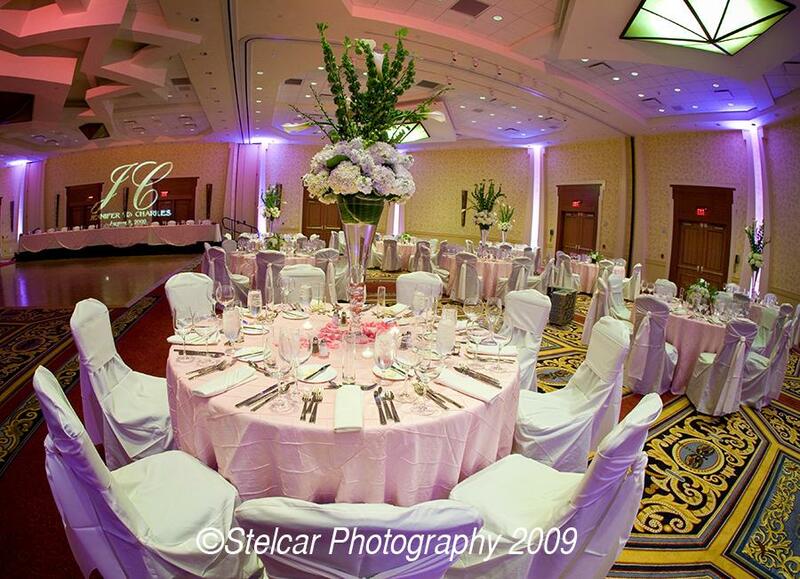 The ballroom was completely transformed with a mix of high and low centerpieces, uplighting, ceiling wash and gobo. 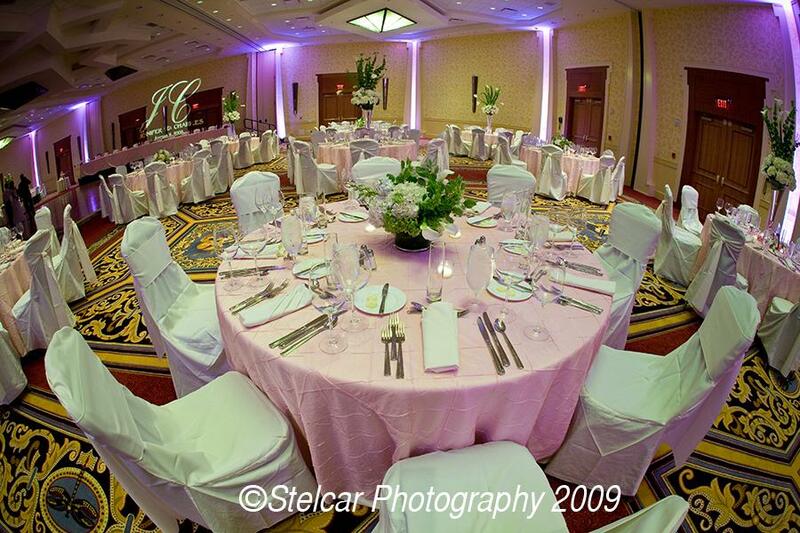 Tables were dressed with blush pintucks from Dove Linen, off-set by ivory napkins. 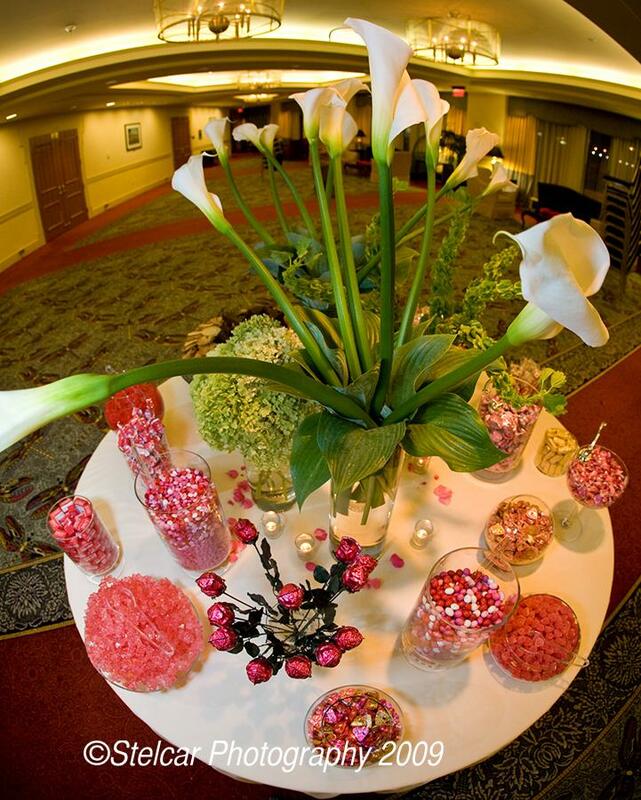 Tall & low centerpieces were composed of hydrangea, Bells of Ireland and callas and really brought the space to life. DJ Jon March of PowerStation did an awesome job with the lighting as well as keeping the dance floor packed both in between courses and after dinner. The cake was from the venerable Modern Pastry Shop and had very interesting detail, which played off of the couple's invite. 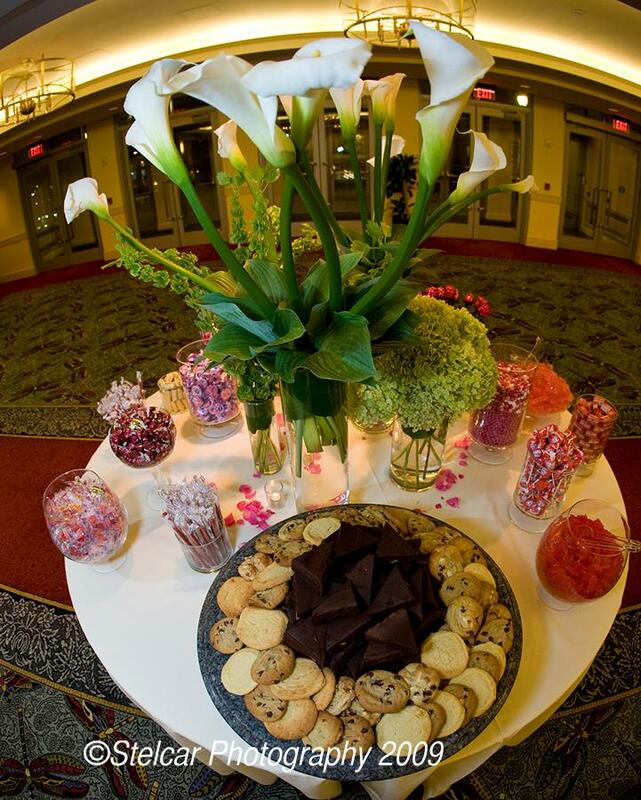 Last but not least, an enormous and extensive candy bar featuring every single kind of pink candy you could ever think of bid guests a sweet good night. Jen and Charlie were thrifty indeed and picked it all up the day after Valentine's. Jen and Charlie, it was wonderful getting to know you both this year. Your wedding was a true success and we loved every second of working together. We wish you the best in your married life.